Description: Bauer Uncle Sam's Hat Brooch - Another great three-dimensional piece from Dorothy Bauer Designs; I apologize for the poor scan. Alternating red and clear rhinestones in the top portion, the bottom band and brim are done in sapphire blue rhinestones, with the band overlaid with star shapes set with tiny clear rhinestones. Set in goldtone (23K plate), this measures 1" x 3/4" and is about 1/2" deep. Great by itself or in a group with other patriotic pieces. 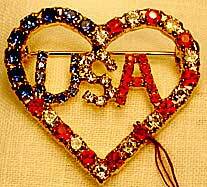 Description: Bauer USA in Heart Pin - Show that you love the USA. The U is blue, the S is clear, and the A is red rhinestones. Upper left part of heart is blue rhinestones, with remaining heart done in alternating red and clear rhinestones. About 1.5" x 1.25". Set in goldtone. Description: Bauer Red-Clear-Blue Ribbon Tac Pin - Once again, extremely well done version of the multi-strand ribbon. 1 3/8 x 1/2 inch. Set in goldtone. 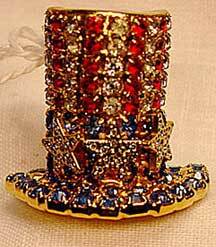 Description: Bauer USA pin - Standard version of USA - red rhinestone "U", clear rhinestone "S", and blue rhinestone "A". 1 1/2 inches x 3/4 inch. Great alone or in combination with other patriotic pins. Description: Bauer Striped USA pin - A more difficult to make version of the USA pin - instead of each letter being a different color, all three letters are all three colors, and done in such a way as to look striped - red on the top rows, clear on the middle rows, and blue on the bottom rows. About 1 1/2 inches x 3/4 inch. 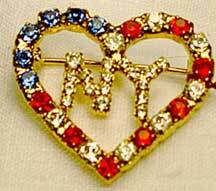 Description: Bauer NY in Heart Pin - Want to express your solidarity for the city that took the brunt of September 11? This says it all. Approximately 1" at widest points.